Tectonics in the Legal Industry: Is the Generalist Attorney a Thing of the Past? As the legal industry continues to evolve, partners face increasing pressure to prove their value and find their fit within an ever-changing marketplace. There are tectonics at work in the legal industry and they look a lot like what is happening in corporate America. The ground beneath us is constantly shifting, keeping the legal industry agile, and reminding partners they must remain strategic as they strive to be valued at their firm and be the counsel of choice for their clients. Due to these changes in the market and this intensified competition, it is imperative to set yourself apart as a partner in order to remain a vital component to your current firm as well as to a potential new employer. 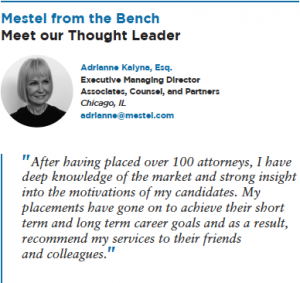 Based on our experience working with clients across the country on their lateral partner hiring needs, we know that law firms and companies want professionals who are experts in their particular market vertical. It no longer cuts it to be a “jack of all trades.” This is born out of the volume of law firm mergers in recent years. Firms are continuously trying to deepen their bench of experts at all levels of the practice in order to capture more of their client’s business. Like business, it is critical that you identify an expertise early in your career and then ensure that you are on the correct platform for optimized growth depending on your practice type. If the generalist attorney is becoming a thing of the past, how do you survive and thrive as a specialist? Am I in a specialty that can survive and grow in the “new” economy? Am I successfully serving as an indispensable part of a team that services an institutional client base, or as a go-to specialist who can attract, service, and cross-sell to clients? Is my firm’s structure aligned with my practice and allowing me to maximize my business potential, growth, and skills as a specialist in my particular field? Your primary objective is to be indispensable to your client base and have ample opportunities within your firm. Not only is it critical for partners to identify where they best fit culturally, but also where they can best attract a client base. This can come to you early in your career or evolve over time as you find opportunities for business development or embed yourself in a highly sought out practice group. For some firms, it is desirable to achieve top profits per partner (PPP) and revenue per lawyer (RPL), which requires building out the ideal mix of specialists. These firms capture the high rate work in the market, including “bet the company” litigation and big deal corporate work. To do this successfully, they must have the capacity and right attorneys to service this work. However, capturing the most work from the firm’s client base also necessitates building out the right specialty practices that serve the existing client base and complement the core practice areas. These specialty practices tend to demand higher rates due to client need and limited availability of expertise. While being a part of these practice groups can be both intellectually and financially rewarding, it comes with its own set of risks. Partners in high rate firms tend to have limited opportunities to develop business. They tend to service institutional clients and if anything happens to those clients, or their practice groups become too large with dwindling business, their positions are at risk. You must be keen to signs of these developing circumstances and look for alternatives before the tides shift. Middle market firms are now grabbing sophisticated specialists as their client base becomes more demanding, with the promise of a more flexible rate structure and a diverse client base. This is just another sign that generalists are on the wane and specialists are in demand. It also signals the importance of the platform and core practices aligning with your area of expertise in order to maximize growth opportunities. Partners must continually assess opportunities for cross-selling as well as the depth of work with institutional clients and prospects to generate business. For example, if you are getting business development opportunities in your specialty but are unable to secure the business because of reasons such as: your firm’s rates are too high, you are encountering firm conflicts, or your firm is not interested in the type of client, then reassessing your platform is a must. Considering a move to a firm which may be a better fit for your practice, and perhaps a more flexible platform, could open up opportunities that would better secure your future in the changing legal climate. Either way, partners will benefit from taking inventory of their current practice type, assessing the firm structure, and determining if they are on the best possible platform and career trajectory. Swimming with the Stream: Does Your Law Firm Culture Position You for Growth and Success?